The head of the British government finally got the approval of the Brexit plan from the members of the Cabinet, deciding the intrigue of the past six months. The new project is being presented by the Prime Minister’s office as an unequivocal victory, whereas in reality this document is replete with contradictions and is extremely disadvantageous for London. Nevertheless, even in this form, the draft agreement may not be approved in Brussels. It has not resolved the question of the Irish border, as well as the relationship between Northern Ireland, which is withdrawing from the EU, and the Republic of Ireland, which remains in union. The document was actually approved by only two thirds of the members of the British government. Teresa May, meanwhile, can no longer, as in former times, count on the support of her political forces. How is the new project dangerous for the UK and why has it already led to the resignation of a number of government ministers? The last six months in British society have not ceased talking about whether Theresa May will be able to obtain government approval of an agreement with Brussels on Brexit. The fears were related to the position of the euro-skeptics ministers, whose efforts could lead to a tough exit from the EU - without an agreement with the EU at all. Mrs. May, meanwhile, managed to get the approval of the government (though not all of its members), which was presented as an absolute success. About the achievement of this success, the press service of the Cabinet of Ministers of Great Britain announced on November 13, when it was announced that the British negotiators were able to agree on the text of the document with their colleagues from the EU. Then, May announced the success of the negotiations within the government. In her opinion, this document turned out to be the most successful of the entire list of options that were discussed in Britain before, and which negotiators took with them to Brussels for approval. The Cabinet of Ministers discussed the approved project for five hours, in a document of 585 pages, which describe in detail the conditions for leaving the country from the EU. The text on their sites has already been shown to the public by the European Commission and the British government itself. The official separation of Great Britain from the EU is scheduled for March 29, 2019, after which a transitional period will begin, which will last until the end of 2020. All of them declared their radical disagreement with the concessions to which, according to the draft, Great Britain will go for the sake of Brexit. European Union do not mind? It is not hard to guess that in the European Union they are looking at the draft agreement pressed through May more optimistically. This is largely due to those disadvantageous points in the UK, which were included in it (as described below). The European Parliament declared that they would welcome the agreement: “This agreement is an important step towards the future relationship between the EU and the UK”. European functionaries in general, speak very positively about the new British project “soft” Brexit. Thus, the head of the European Commission, Jean-Claude Juncker, spoke about the letter he sent to the head of the European Council, Donald Tusk. In it, Junker called the draft agreement "substantial progress." In his opinion, the main European negotiator, Michel Barnier, did not disperse with him, calling the document a decisive step forward. The fact of receipt of such a statement from the person who led the negotiations from the European Commission says a lot. At a minimum, the delegation at the talks was able to fulfill the assigned mission and impose a number of difficult provisions on Britain. 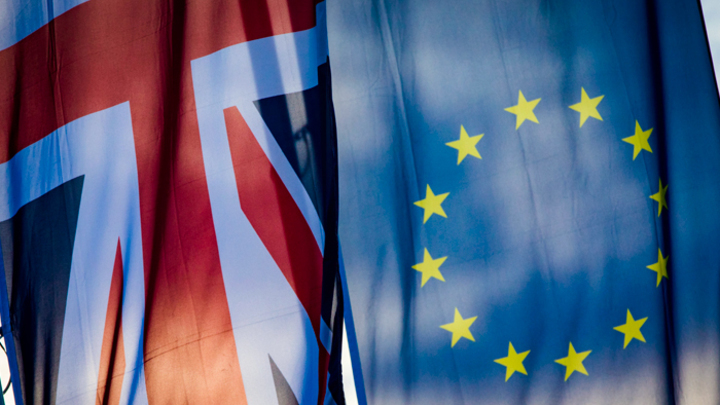 The draft agreement with the EU assumes that during the transitional period, the United Kingdom will remain a member of the European Union customs union. London will undertake to strictly abide by the rules of the single European market. What does it mean? In fact, the most basic argument of the Brexit supporters was failed, the outcome of which should be the economic independence of Britain. However, the preservation of membership in the customs union suggests that London will not be able to enter into trade agreements with other states. Britain will not be able to introduce its own rules of economic regulation, and will have to follow those that exist in the EU. At the same time, the EU will, in March 2019, “throw out” Britain from all its structures. In particular, British parliamentarians will lose their authority to participate in the drafting of European laws. London will also be obliged to complete all previously concluded trade transactions and will not cease to be a participant in the six-year draft EU budget. However, the kingdom sweetened the pill, promising some "compensation", the size of which while in the document for some reason is not specified. In general, the issue of the customs union and the openness of the UK market after Brexit is the most sensitive. What is important is not a political gesture, but an economic sense. London very much did not want to remain in the single pan-European market, which makes it impossible for them to pursue an independent economic policy and conclude their own trade agreements without regard for Brussels. Moreover, the demand from Britain, which May had so successfully failed, had legal justifications. For example, the British negotiators claimed that the kingdom would then lose the possibility of internal regulation in terms of environmental standards and in other areas. Proponents of a tough Brexit were expected to be outraged by this nullification of these conceptual provisions, which were supposed to guarantee economic sovereignty to the kingdom. Euroskeptics argue that Britain will ultimately retain its dependence on the EU, which will be beneficial only to global companies, from which British enterprises will suffer. Finally, the status of Northern Ireland and the Republic of Ireland hung in the air. The draft does not answer the question of how these territories will coexist after Brexit. Britain agreed to leave Northern Ireland in the EU Customs Union with all the established certification rules and attributes of an open market. Britain did not want to establish the border between the two Irish territories, fearing the resumption of Irish separatism. However, in return, the kingdom seems to receive from the EU the border between Northern Ireland and the rest of the country, which in the future could lead to a more serious explosion. Customs posts will be established at the border. London offered to create a free customs zone in Northern Ireland, but the EU was against it, since it would give preferences to British companies. If the agreement to resolve the Irish issue is not accepted by Britain and the EU before July 1, 2020, then the transition period may be extended, but the terms of the extension are not specified in the draft. What is the result? The victory, about which Teresa May speaks, is in fact a defeat, a rejection of a number of Brexit's conceptual positions, for the sake of which he, in fact, was started. The new deal should now be approved by all EU members at the Brexit Summit, which will be held on November 25th. Then the agreement will have to support the parliaments of the European Union and Britain. And if there is almost no doubt of support from the first, then with the second, the problems are obvious. Theresa May does not have an overwhelming majority in the British Parliament. If parliament rejects the deal, then the prospect of a tough Brexit will loom more and more noticeably before London, that is, without any agreement. Thus, the UK is becoming increasingly bogged down in the process of Brexit, the holding of which now requires not only economic but also political will, which ambassadors May could not show in negotiations with the EU.